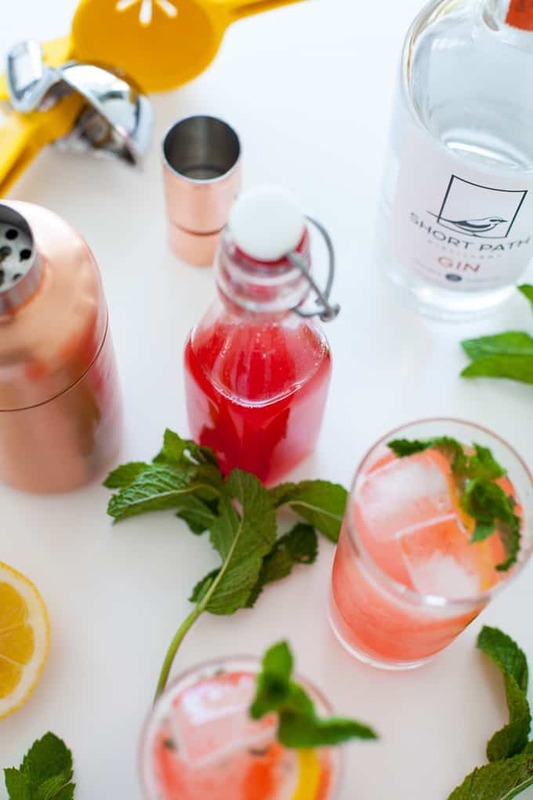 This strawberry rhubarb gin fizz is bright, refreshing and super seasonal. 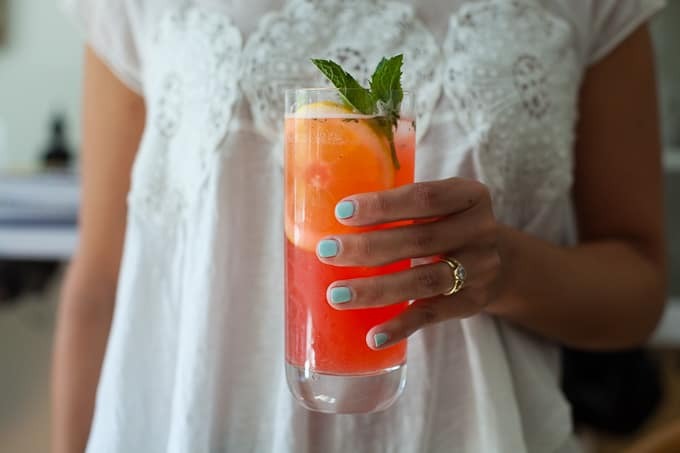 Make this cocktail for your next spring gathering or just for a fun Friday night happy hour. I love strawberry rhubarb. Strawberry rhubarb pie. Strawberry Rhubarb smoothie. Strawberry rhubarb compote. You name it. There’s something about the sweetness of the strawberries paired with the tart rhubarb that tickles my tastebuds. If there was one month of the year to eat all the strawberries and rhubarb it would be May as both produce are in-season right now. That’s why when The Recipe Redux challenged us to make a cocktail for spring celebrations, I knew it had to be strawberry rhubarb. Seriously though May and June are the months for celebrations like graduation, bridal showers, weddings, you name it. I have two bridal showers next month and I know this strawberry rhubarb cocktail would be a huge hit. But even if you don’t have any big celebrations this spring, why not just celebrate life and your awesomeness with a fancy happy hour for you and your beau or friends. That’s what Steve and I did — the two of us only have six nights at home together this month (it’s crazy travel season for both of us) so we had to make the most of our few nights together. This cocktail was the perfect beverage to celebrate us time with. The cocktail does take some time to make since you’re making your own homemade infused simple syrup but it’s by no means complicated. You throw some strawberries, rhubarb, sugar and water in a pot, let it simmer until the fruit breaks down. Enjoy the delicious wafts similar to strawberry rhubarb pie coming from the pot while it simmers. Let it cool to room temp and then strain. Straining probably takes the longest but you can make some appetizers while you wait for your syrup to strain. Make sure you save the cooked fruit leftover from the syrup and stir it into yogurt, oatmeal or top pancakes waffles, or peanut butter toast with. The syrup is a beautiful bright red color and sweet in flavor, reminiscent of strawberry rhubarb pie filling. 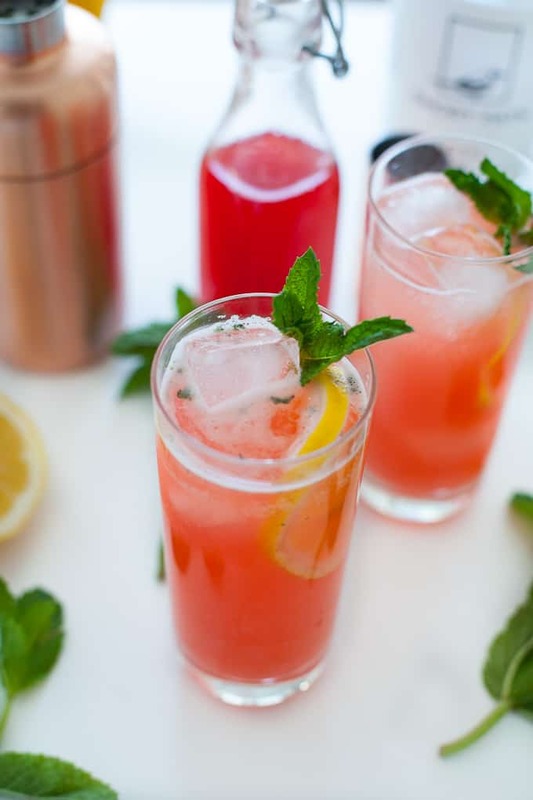 But the drink is well balanced with lemon to brighten the flavor and add a little acidity and a little mint to add a very subtle refreshing herbaceous element. Club soda also helps to dilute the sweetness of the syrup. It took me a few tries to get the sweetness juuuuust right but I think I finally nailed it. The drink is more refreshing than it is sweet (I don’t like overly sweet cocktails). But if you do, simply add more syrup to taste! The good news is the syrup makes about 2 1/2 cups worth so you can store the syrup in the fridge for future happy hours if you don’t use it all up at one gathering. 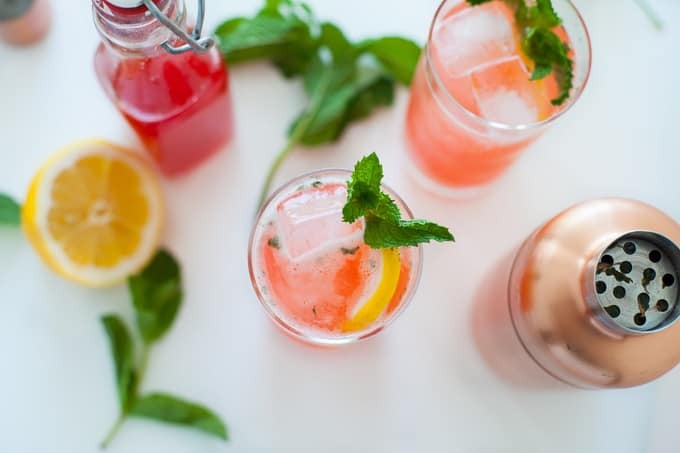 Serve these drinks up in tall glasses with a slice of lemon and garnish of mint to make them look extra pretty. Oh, and for that classic fizz? Shake the heck out of that cocktail shaker and the club soda will help too :). Add strawberries, rhubarb, sugar and water to a medium pot. Bring to a boil. Lower heat and let simmer for 20 minutes, or until fruit is broken down. Let the mixture cool to room temperature. Place a cheese cloth or fine mesh strainer over a medium mixing bowl and pour strawberry rhubarb mixture into the cheese cloth or strainer. Use a wooden spoon to press down on the mixture to strain. Once you’ve extracted as much liquid as possible, store the remaining fruit pulp in the fridge for future use. Add the syrup to a bottle or jar to store. Add lemon juice and mint to a mortar and pestle and gently muddle the mint*. Pour lemon juice and mint into a cocktail shaker. Add syrup, gin and ice and shake vigorously until combined. Add ice to two cocktail glasses. Pour cocktail evenly between the two glasses. Top it off with club soda and enjoy! If you thoroughly muddle the mint, it alters the color of the cocktail. Muddle the mint just enough so that the flavor is incorporated but you don’t end up with tiny pieces of mint throughout the cocktail. 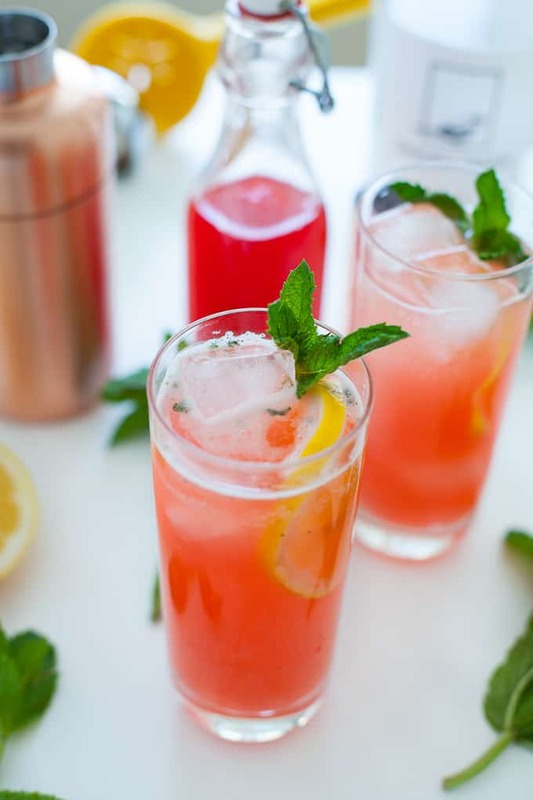 Tell me, have you ever tried a strawberry rhubarb flavored cocktail? Pinned this for later because this sounds so perfect for spring! what a pretty cocktail! Perfect for this beautiful weather we are having! Strawberry and Rhubarb are my favorites too. This looks and sounds delicious! Great minds my friend! I too love strawberry and rhubarb together and made a margarita for our cinco de mayo party. Have also done mimosas and now can’t wait to try your gin fizz! And i’m totally with you on saving the fruit that’s leftover from the simple syrup – no reason to discard all that good stuff! Thanks Jessica! Those mimosas sound divine…. 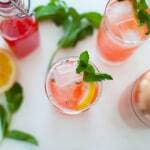 Love the idea of strawberry and rhubarb in drink form!